Egypt’s President Abdel-Fattah El-Sisi praised on Wednesday Vietnam’s economic and industrial achievements during the first-ever visit by an Egyptian president to Hanoi, state news agency MENA reported. During a dinner with his Vietnamese counterpart Tran Dai Quang in Hanoi, El-Sisi said the South East Asian country’s achievements in development and modernisation reflect the strong will of its people and their ability to work and achieve. The two leaders signed nine memorandums of understanding in a number of economic fields. El-Sisi invited Vietnamese businessmen to invest in Egypt, saying the country provides a good investment environment that is beneficial to vietnamese capital. 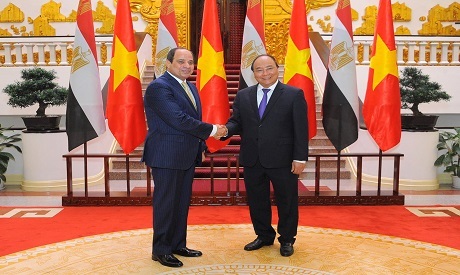 The Egyptian president said that Egypt shares a special relationship with Vietnam, as both countries share a similar experience in their respective regions. Though Egypt and Vietnam established diplomatic ties in 1963, El-Sisi stressed that the two countries' relations predate 1963, as late Vietnamese president Ho Chi Minh visited Egypt three times where he met with Egyptian president Gamal Abdel-Nasser. Also on Wednesday, El-Sisi and his Vietnamese counterpart laid flowers at the memorial of Ho Chi Minh, who led the national liberation movement against the French and the US.